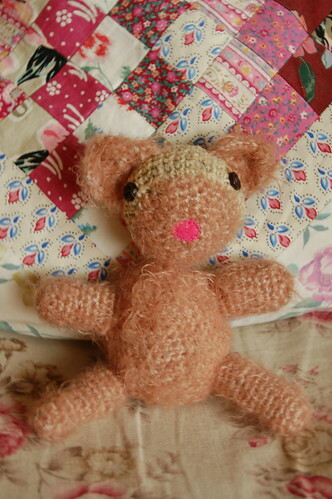 I almost never use a pattern; I just look and try to get the right size of ears, arms and legs. I think Miss Muffin girl is rather cute. Miss Smilla (the cat) with her newly adopted baby, Miss Muffins girl. I like that they have the same colours, and Miss Muffins is almost as soft as Smilla. I feel happy to have found out about the Amigurumi Crochet Trend, and to have joined it. yay! This entry was posted in Crafts and tagged amigurumi, crochet, smilla, softies, trending. Bookmark the permalink. Lika kreativ som vanligt ser jag h?r! Tack f?r fikat idag! Om det ?r lika tomt i min kalender som det ?r nu ska jag ta med mig Anders och komma f?rbi igen p? onsdag kv?ll. Annars f?r vi h?ras av. Miss Muffin is adorable! And that picture of her and Smilla together is so warm and sweet. Det var et fin bilde med katten din og kosedyret! Nu l?mnar jag S?tergl?ntan och mj?jlighet till att komma ut p? n?tet, s? jag t?nkte bara passa p? att ?nska trevlig midsommar! Awwww, so cute & cuddly . Thanks for your nice comments. 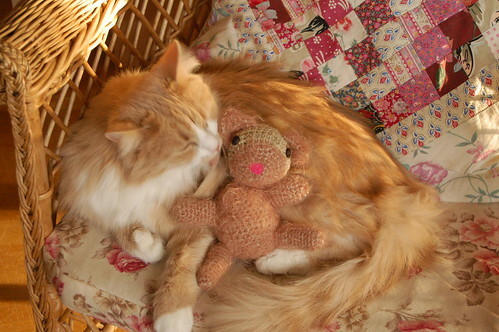 Evinrude: no, I don’t have a pattern, she comes from my own imagination as most of my crocheted a animals. Sorry, but I hope you can make up your own pattern. Good luck!